I’ve moved to Rosa Maria’s house. Rosa referred to herself and Mirna as “los dos ricas” (the two rich ones) because they both have dirt floors in their houses. But you couldn’t ask for nicer people to be around in both cases, nor more pleasant surroundings. Rosa Maria is an avid gardener and her enclosed (they all are enclosed) back yard is absolutely gorgeous. Fruiting trees: mango, limon, coconut, banana, plus asparagus and squash, and ornamental plants of the type we in the north pay a small fortune for, for our living rooms. This family has a pet racoon about eight inches long in body. They bottler fed it when they got it and the two grandkids, Rosita, 5, and Alan, 3, both play with it a lot. The door is always open so it could run away, but it runs after the kids and wants to be picked up instead. 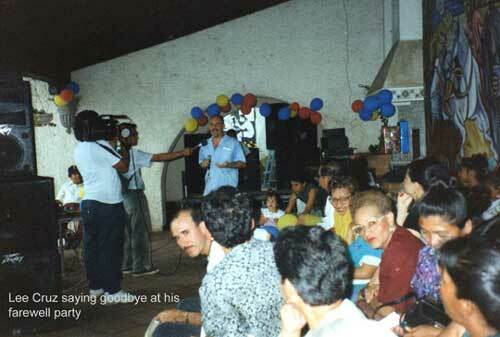 Yesterday was the Grand Despedida (big farewell party) for Lee Cruz. It was well-planned. When proceedings started, there were short speeches by people from the many different projects lee has worked with: building pre-schools, public health and hospital help, agricultural projects including installing rope-and-wheel pumps. You name it, he’s done a lot. Many of the speakers couldn’t complete their statements, they were crying so hard. Lee’s talk was emotional and with tears, but also had substance. He did well. There was canned music for dancing until 7 p.m. when a live group (good, too) came on. Waiters came by with drinks (Coke or highballs). There were beautiful trays of canapes and lots of them. I thought that was plenty, so I was surprised when we were handed plates of hot dinner a bit later. At 9 o’clock we were brought a dessert. All the while the dancing continued, and the trays of beverages kept coming in. No, I didn’t dance; they didn’t play one two-step all night. Rosa Maria and Norma danced a lot. One thing that was a particular kick was when three little girls from the Hogar (the orphanage the SCP works with) cornered Lee and danced with him. Charming! It was a good party and Lee deserved every bit of praise he got. I hate to see him go, but wish him well in his new ventures. It was also Dia de la Raza, Race Day. A day to honor people of all colors. Earlier in the day, Rosa and I went to her son’s school to watch the outdoor program. Walter will graduate this year. This is a private school and it is big. There are three sessions a day, and the kids pay ten cordobas a month to attend (about $1 US). Some times it’s hard to come up with that tuition. Students go to primaria for six years, to secondaria for five years, and if they want to graduate with a bachillera one goes another five years. A Spanish teacher in Wenatchee told me when kids get that, it’s the equivalent of a college education. Maybe it’s like an AA degree? I don’t know. If students want to go to university, they have to have completed that bachillera step. Rosa Maria’s Walter will get his bachillera in December. Meanwhile, he is also going to night school taking a course in computers. All of Rosa Maria’s kids have her smiling, good-natured disposition. Her daughter Fatima lives with her mother and has two little kids that I love a lot. About a year ago, Fatima was in the hospital with serious heart trouble for a long time. She’s young, beautiful and has a happy disposition despite her problems. She showed me her doctor’s list of medications. There was one medication they don’t buy because they can’t afford it, and lots of Vitamins C and E, and Jarabe de rabano. That’s syrup of radish. Fatima laughed as she pointed out the “indications” to me. It’s also good for “cretinism” and for the “sexual development of the young”.